This construction video tutorial is very useful for civil engineering students. 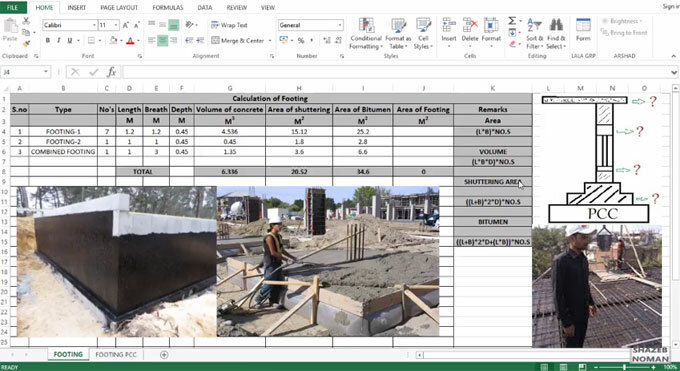 In this video you will learn how to work out the quantities for footing PCC. PCC in foundations is applied with the purpose of arranging a plain surface underneath the footing. It also enhances the bearing strength of underlying surface of footing/foundation. Based on the nature of soil, the density of PCC is chosen. Plain cement concrete (PCC) offers inflexible impermeable bed to RCC in foundation wherever the earth is soft and compliant. PCC is utilized over brick flat soling or exclusive of brick flat soling. PCC is built up to deliver the load over the PCC to the soil underneath. Plain cement concrete is also known as “cement concrete (CC)” or “binding concrete”. The main objective of PCC is to get rid of direct contact of foundation with soil that can produce dampness because of capillarity. Cement: Normally, Portland cement is applied as bonding material in PCC. Fine Aggregate: Sand is employed as fine aggregate. The FM of sand should remain at 1.2 to 1.5. Course Aggregate: Usually, brick chips are utilized for developing PCC. Besides, stone chips are also applied herewith. The size of the course aggregate remains 20mm downgrade. Water: Pure drinking water should have been utilized in PCC. 1. It is applied as a supportive layer for the RCC above in order that water from the RCC is not consumed by the earth underneath. 2. Arranges a base for the concrete and also allows workers to lay out the structure above in a simplified manner. 4. Moisture existing in soil is not absorbed with R.C.C footings that leads to corrosion of reinforcement. So, PCC is required in this condition. To know the calculation process for determining the PCC quantities, go through the following video tutorial.